“My husband, Gary, and I made your heart healthy dinner tonight to rave reviews from our kids — ages 9 and 13. Well not really rave, but they ate it! The quinoa was fabulous, the roasted vegetables were very tasty and the salad with the ginger dressing was spectacular! The peach cobbler topped it off — coconut oil and all. Thank you very much. 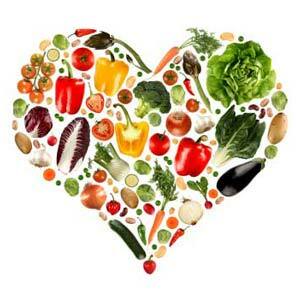 I appreciate the recipes and your website.” –SBG, Grass Valley, CA. I love that this young mom was able to come away with real food ideas to nurture her health and that of her family, and at the same time, to derive pleasure from the prep time with her husband. 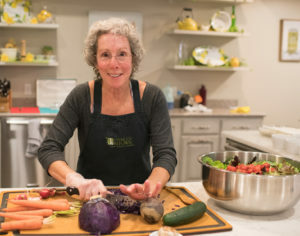 A collaborative effort between HeartMatters and In the Kitchen, the recent Eat to Your Heart’s Content cooking class was a colossal success–we’ll be repeating the class seasonally, with the focus being easy, delicious, fun, and nutritious meals and snack ideas. Yum!